The woman who lived in this house was a needlepointer, it seems, as there were some tapestries/canvases for sale. I found only one box of yarn, though. 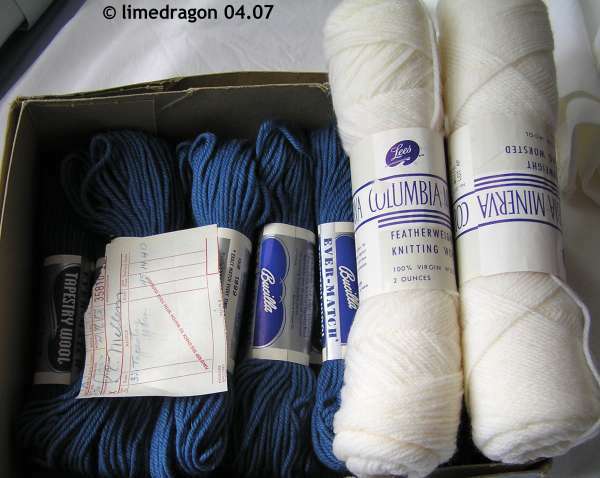 The two white skeins are Columbia-Minerva Featherweight Knitting Worsted. There’s no yardage listed, but each weighs two ounces. The blue is Bucilla EVER-FAST Tapestry Wool. There are 15 skeins, 40 yards each in a denim blue (Color #1999). Also in the box was a receipt dated April 16, 1963, and the skeins were priced 45 cents each. Guess where the yarn was originally purchased? Now, as for the cooties part of the post. Rest assured, I didn’t find evidence of moths, but I’ve put the white wool into a ziploc and the blue tapestry wool box is separate from the rest of my stash until I decide what to do with it. Herb Schaper, a letter carrier for the U.S. Post Office, whittled the first COOTIE out of wood in 1948. In the first years, Schaper built, by hand, 40,000 wooden COOTIE games. Three years later, more than 1,200,000 were produced with the aid of machinery. By 1978, COOTIES 30th birthday, more than 30 million COOTIE games had entertained children worldwide. Milton Bradley [Company, now Hasbro] acquired COOTIE and other Schaper classics in 1987. Based on my memory of the game box from when I was young, I’m not sure the 1987 date is correct. And what’s more, the history information at Hasbro’s website shows that MB was acquired in 1984, so perhaps it is a typo for 1978? Anyway, there is a bit more information about Cootie available at the Hennepin History Museum. This older plastic version is much more colorful than the version I played. I also wonder if any wooden versions of this game still exist? What great sale finds!! 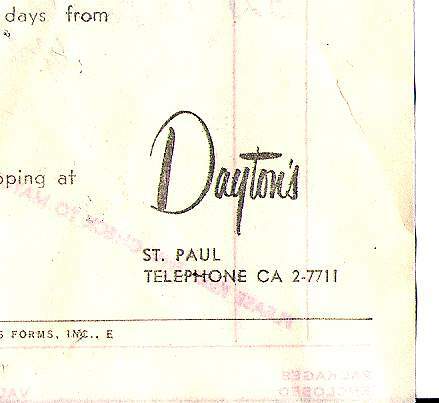 I didn’t know that Dayton’s had ever carried yarn – I’ve seen evidence for Penney’s and Sears before. And how fun about the Cooties game. Wow! The father of my best friend in high school (Wayzata) used to work for Schaper. 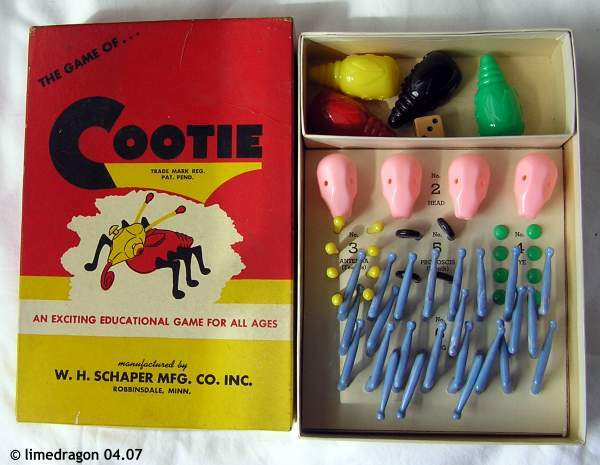 We always had plenty of “Cootie” games around. What a blast from the past. Thanks for sharing. What great finds! Love the cootie game. And I think you should frame that Dayton’s label. Geez, I miss Dayton’s. It just hasn’t been the same. Oh EXCELLENT! We had an old set when we were kids – it looks very familiar. I miss Daytons. How cool! What great finds… like digging up lost treasure. That Cooties game looks just like the one my grandparents had. I played with it for hours. sniff I wonder what happened to it. hmmm… what are you going to knit from the yarn? Socks, sweaters? Great finds! Yes, years ago most of the big department stores carried yarn. Some even had expert knitters available to answer questions. I miss Dayton’s, too. None of the department stores are any fun anymore. Too cool! Love the old Cootie game. Such memories. I REMEMBER that Cootie game! And I remember when it was an insult to tell someone they had cooties. All BOYS had cooties! That is, until a few years later when their cooties mysteriously disappeared. What great finds! You even have the box for the tapestry wool. The old Cootie game is just too cool.